When you’re doing what you love, the hours on the clock have no meaning. There’s no need for frills or trimming when your heart is in your work. The passage from one state to another is crucial: from the aesthetic to the moral plane, taking responsibility for what one does. The finished product is what inspires and drives the whole thrust towards bringing the ideas in Rossi shipbuilding to fruition. All eyes are riveted on the boat that is under construction and it is essential that this should be so. It is a force for propulsion, a perpetual motion, pushing us to transcend our own limits and which demands of us concentration, care for detail, dedication and sensitivity. And this theory of construction is based on three simple words, a very elementary concept, and one that is always looked for but often found wanting: do it well! Show that the end result, as a whole, goes well beyond the sum of its parts, something built in order to reach this end. And this is the reason why we move from a theory of excellence to excellence in practice. To keep the clear perception that one has chosen Rossinavi because its guarantee of experience is anchored in time, that there is an attention to detail and quality that goes down the generations and is there at every moment of working. We are builders with a passion, who love to experiment and research, find solutions to questions that are specific to the boat we have in our hands. Whatever shape or form that boat may be taking. As long as it’s done well. An excellent solution, a product of excellence, is such in its essence, as the outcome of an unreservedly logical process, one to be implemented according to the criterion of excellence, to build well beyond a mere appeal to the aesthetic, although this as a factor, of course, which retains its importance. Having the in-house resources to be able to deploy tools for development that will give excellent results, the Officine Rossinavi is able to watch over every phase of construction in its own yards, from the design stage to the assembly of the individual parts that will go to define the finished boat. From the minute design of a screw in Ergall to the long sweep of a hull, each and every piece is thought out for its own value and made without recourse to subcontracting. Made well, made in-house. Respecting the working logic that it has to have if it’s to be excellent. If that part goes there, it’s because that is how it’s meant to be! The whole of so many specifics in a boat, given the layouts, the perspectives, proportions and footage, pursuing the proper engineering processes, is what drives the exigencies of a constructive process by set rules. The one-off boats that come out of the Officine Rossinavi are so because the individual parts they are made up of are just that, one-off. 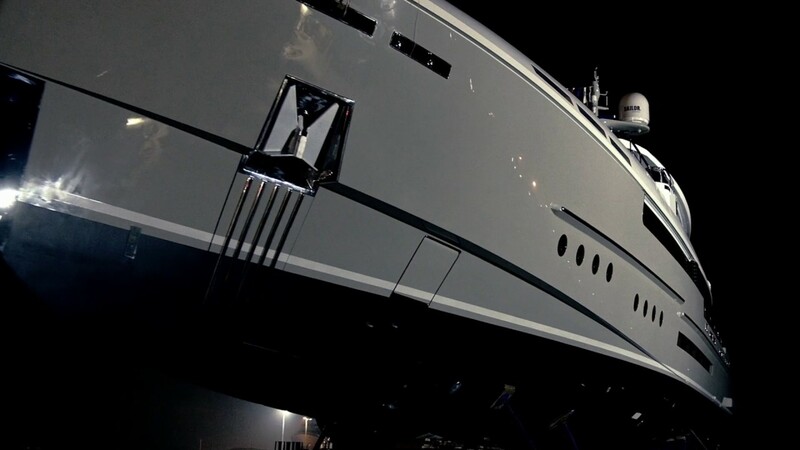 And each and every part, each solution, is excellent because the boatyard’s construction philosophy, its very essence, is to build well, with the awareness that comes from working experience. Each part in its place: a rigorousness born of experience, of vision and the capacity to imagine the boat sailing through the thousand and one journeys that the sea, in all its freedom, will write upon it.